GSI is a proven Department of Defense (DoD) contractor with core capabilities including environmental consulting, environmental remediation, munitions response throughout all Comprehensive Environmental Response, Compensation, and Liability Act (CERCLA) and Resource Conservation and Recovery Act (RCRA) phases including land and marine sites. We have executed over $62M in Military Munitions Response (MMR), $15M in Environmental Compliance and Remediation Services (ECRS), and $3M in Other Munitions-Related Services (OMRS) for the USACE, NAVFAC, and other DoD customers. GSI's prime contractor experience includes multiple MMR/ECRS projects valued at $10M for USACE Omaha; two high profile U.S. Army Engineering and Support Center, Huntsville (CEHNC) MMR projects at Martha's Vineyard valued at over $20M; and $15M in MMR/ERS services for Albuquerque, Sacramento, and Honolulu USACE Districts. GSI holds all appropriate Bureau of Alcohol, Tobacco, Firearms, and Explosives (ATF) licenses for purchase and use of explosives, and has on staff project management personnel, engineers, scientists, geophysicists, licensed blasters, and over 60 permanent certified UXO personnel. GSI also has considerable experience related to Emerging Contaminants, specifically per- and polyfluoroalkyl substances (PFAS). Recognizing the concerns surrounding the impacts of PFASon human health and the environment and a need for additional research and development (R&D) and investigations, a formal Cooperative Research and Development Agreement (CRADA) between GSI and the U.S. Army Engineer Research and Development Center Environmental Laboratory (ERDC-EL) was executed. The purpose and objective of the CRADA is to provide for free exchange of information between GSI and ERDC and to collaborate on the joint conduct of R&D activities and investigations related to environmental contaminants and military relevant compounds (MRCs) that includes PFAS contaminated media. GSI was awarded this contract to support the Air Force (AF) MMRP and perform a Wide Area Assessment (WAA), CSE Phase II at three Munitions Response Areas (MRAs) and an RI/FS, PP, DD and Land Use Control Implementation Plan (LUCIP) at two MRSs to address UXO, discarded military munitions (DMM), and MC in accordance with CERCLA. The CSE Phase II field investigation, equivalent to a CERCLA Site Inspection (SI), was performed for three MRAs located adjacent to Joint Base Elmendorf-Richardson (JBER): Davis Range A (9,197 acres), Anti-Aircraft Range-TD (2,336 acres), and Anti-Aircraft Range No. 1 (9,198 acres). GSI obtained a Special Use Permit to allow helicopters to land in the state park since access to the MRAs were not accessible by vehicle or by foot. GSI implemented an innovative technical approach by combining WAA, historic research, and a range analysis to determine areas that could not contain MEC. GSI developed an approved exit strategy for the AF at the CSE Phase II stage instead of progressing to an RI for the remote sites. This approach eliminated approximately 6 years from the overall project schedule. The Cape Poge Remedial Action project is a highly complex munitions and explosives of concern (MEC), materials potentially presenting and explosive hazard (MPPEH), and explosives hazard clearance action within the Land Munitions Response Site (MRS) and Inland Water MRS at the former Cape Poge Little Neck Bomb Target Site. The Land MRS includes approximately 62 acres of upland, beach, marsh, and ponds. The Inland Water MRS includes 172 acres comprised of both intertidal surf zone as well as offshore areas in Cape Poge Bay. This project, following the CERCLA process, required permit equivalency in lieu of acquiring actual permits. Clearance activities include subsurface removal with the overall objective to achieve unrestricted use/unrestricted exposure (UU/UE) for both MRSs. Over 26,400 anomalies were interrogated with 3,822 MEC items processed through explosive demolition, and 39,427 pounds of materials documented as safe (MDAS) shipped off site for final disposition through smelting. 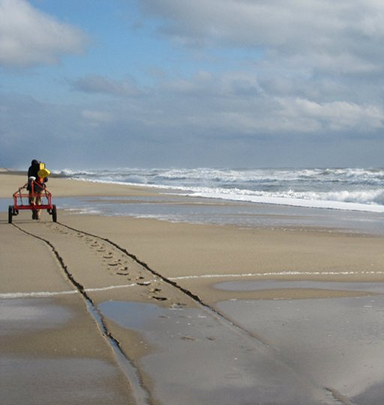 To account for the large number of items requiring demolition, GSI sited a Bureau of Alcohol, Tobacco, Firearms, and Explosives (BATFE) Type II magazine on Martha's Vineyard, and utilized a dedicated blasting team with four wheel drive blasting truck to transport donor explosives over the dunes/barrier beach. 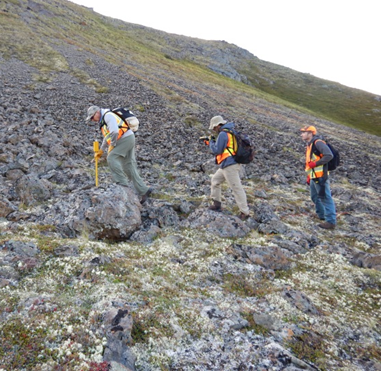 Despite the size of the removal area increasing by over 26% to address "step-out" requirements, GSI completed all field work within the original Period of Performance. GSI performed sampling of groundwater and drinking water at the Former NAS Agana to test for PFAS, specifically perflourooctanoate (PFOA), perfluorooctane sulfonate (PFOS), and perfluorobutane sulfonate (PFBS), to determine the potential occurrence in the public water system. The site was historically used as an airfield by the U.S. Army Air Force and turned over to the Navy in 1947. The most common historical use of PFAS at the Site has been as a fire extinguishing surfactant in Aqueous Firm-Forming Foam (AFFF). 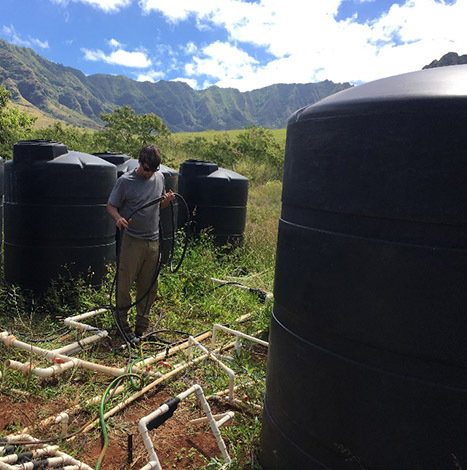 Field activities at the NAS included groundwater sample collection up and down gradient of the Site. Samples were collected at three (3) downgradient monitoring wells, two (2) upgradient monitoring wells, and one upgradient production well. Due to its ubiquitous presence in a variety of commercial and consumer products, PFC-specific sampling procedures/equipment to avoid cross-contamination were incorporated into the project Sampling and Analysis Plan. A Sampling Summary Report was prepared describing all field activities, summary of sampling data, chemical analytical results, results of the data evaluation and validation, conclusions and recommendations. 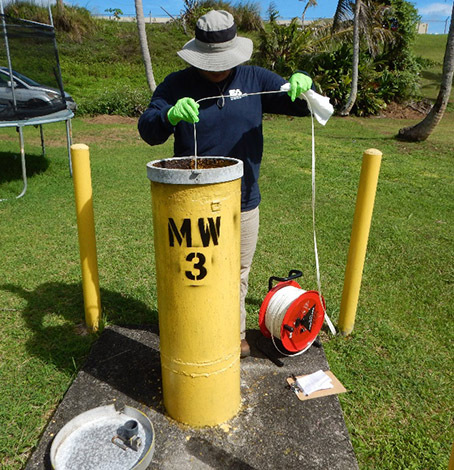 GSI was contracted by the USACE, Omaha District to conduct pilot-scale in situ bioremediation for the Makua Military Reservation (MMR) Live-Fire Training Area. 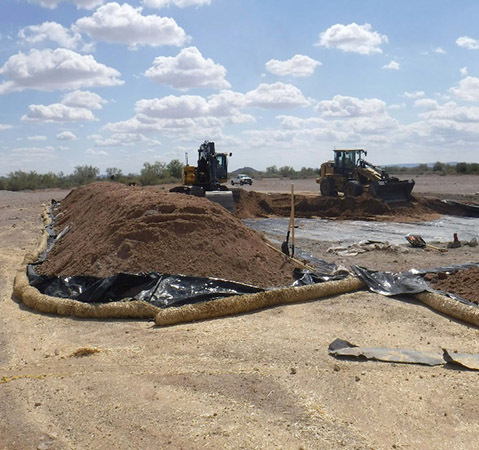 This current phase of the MMR bioremediation project is part of an ongoing effort that represents over 10 years of phased projects to evaluate the most cost-effective way to remediate the explosive concentrations within MMR soils. This represents the final phase of the MMR bioremediation study which involved additional field work to optimize molasses application rates and verify numerical predictions, with the goal of minimizing molasses concentrations and water amounts required to affect in situ treatment of RDX/HMX contamination at the MMR. The numerical model was also up-scaled to include simulated treatments within the MMR open burn/open detonation (OB/OD) area and used to perform a numerical feasibility evaluation of implementing biodegradation of RDX/HMX contamination across the OB/OD area, with the goal of allowing the Army to properly evaluate the approach for site-scale application as a remedy to achieve compliance with existing regulatory conditions. This project was of a high level of technical complexity and required expertise in bioremediation design and application, vadose zone hydrology, fate and transport of MC and associated metals contaminants, and hydrogeological/geotechnical testing and data analysis to successfully meet project goals. Download the GSI Environmental Remedial Consulting Services fact sheet. Download the GSI Munitions Range Services fact sheet.